JAMAICA, Queens (WABC) -- An NYPD officer was stabbed in the hand while doing a wellness check in the Jamaica section of Queens. The officers responded to the 57-year-old man's home just before 1:40 p.m. Monday. The man was locked in the bathroom, acting irrationally, when officers responded, according to the New York City Police Department. When the officers opened the door, the man lunged at them, police said. One officer was stabbed in the right hand with a sharp object. The suspect retreated into the bathroom and locked the door behind him. 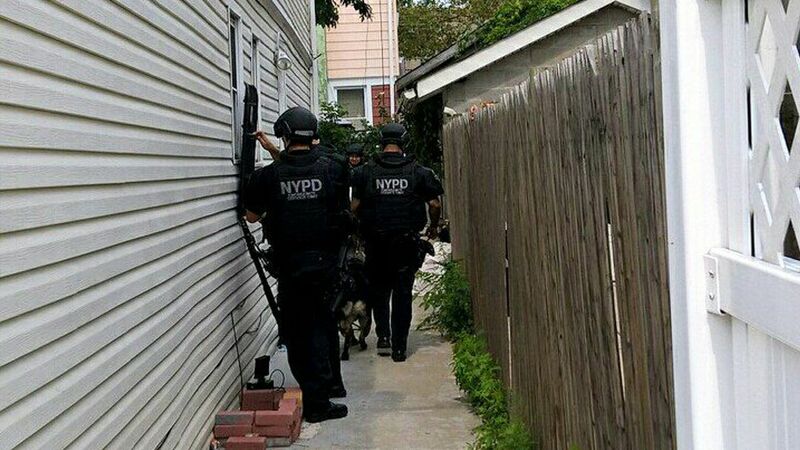 A team of NYPD negotiators went to the scene to persuade the suspect to surrender. After three hours, police took him into custody about 5 p.m.
Crosby Craig, 57, is charged with assault on a police officer, reckless endangerment, criminal possession of a weapon, menacing and harassment.